The Filipino Refugees in the Netherlands learned today of the appalling news that an evacuation camp of indigenous peoples inside a church compound in Davao City was burned down by still unidentified men, injuring at least four children, and destroying what meager personal properties the refugees had. We condemn this barbarous and cowardly crime in the strongest possible terms and demand that the perpetrators be swiftly arrested, prosecuted and justice rendered against them. This evacuation center inside the compound of the United Church of Christ in the Philippines, in Davao City, has served as a refuge since early last year for more than 700 Manobo indigenous peoples from Davao del Norte and Bukidnon provinces. They fled their villages after soldiers and military-backed Alamara militia occupied their communities and tribal schools. We find it utterly appalling that these victims of internal displacement are being hounded and victimized to no end. We find it equally appalling that the Manila government and its security forces have done absolutely nothing to address the victims’ problems. Reports indicate that, at around 2:30 in the morning of 24 February, three as yet unidentified men on a motorcycle started the blaze by pouring gasoline on the canvas roofing of the refugees’ tents and throwing a lighted torch to the place. 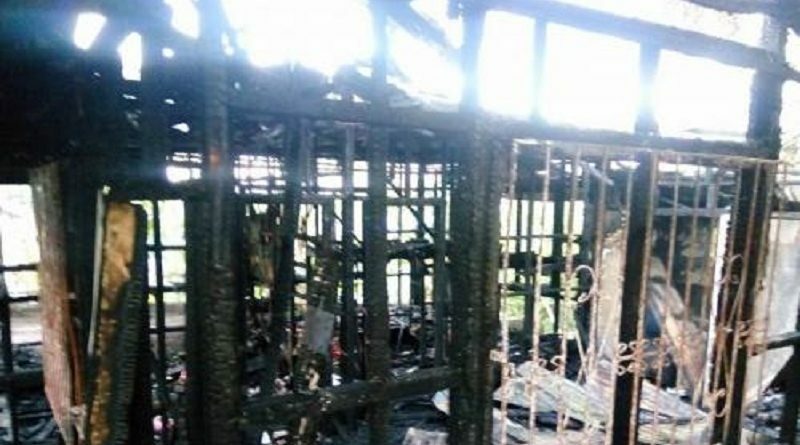 The church compound’s dormitory was also set on fire with gasoline, destroying church properties and personal belongings of the sleeping guests. The Lumad of Mindanao deserve all our sympathy and solidarity. They are defending their homes and communities against the entry of big business and environmental destruction. They are thwarting the relentless deceptions and bribery of corrupt politicians and corporate media. And they are preserving their indigenous culture and way of life in the face of aggression from so-called development agencies. But instead of promoting the peoples’ rights and protecting the natural environment, the Manila government sends armed troops and harassment teams to facilitate this aggression and the eviction of the Lumad communities. The Manila government will have new occupants after the May 2016 elections. We challenge the presidential candidates and their parties to stand with the victimized Lumad of Mindanao and condemn these highly abhorrent and dastardly actions. We call on the international community to sharpen its focus on the heartbreaking conditions of the indigenous peoples of Mindanao. We need to expose to the world the suffering they are experiencing and the potential destruction of the natural environment, all in the name of economic progress and development. We need to make the Manila government aware that the international community does not condone these barbarities and that they should be held accountable for the abuse of their own people. We also call on our Filipino compatriots and friends of the Filipino people to provide financial and material assistance in rebuilding the evacuation center and dormitories, and in the immediate needs of the refugees. More than ever, we need to strengthen our solidarity with the Lumad peoples, in their desire to return to their homes and villages, promote their cultural heritage and protect their natural environment, and in their continuing fight for genuine development and self-determination.